I’m afraid that I’ve been neglecting this site far more than I would like. Studying for PhD exams tend to monopolize one’s time. But the surprise news on Wednesday that a demolition permit had been filed for the C.P.A. Building warrants a quick post. 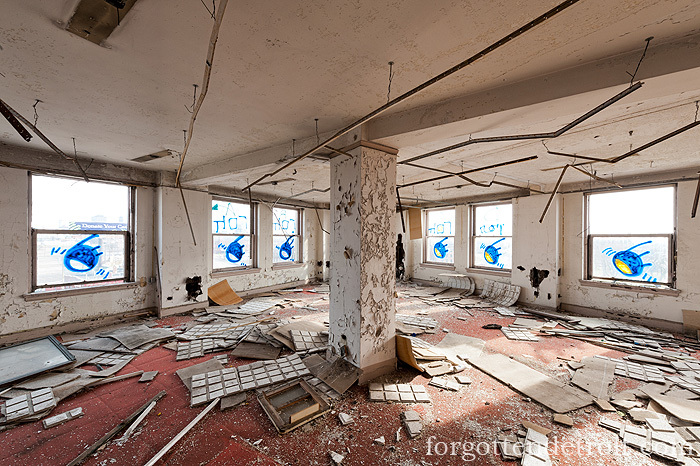 The following photographs are from my one visit to the building in December, 2013. These are my least favorite posts to write. At least those for the University Club and First Unitarian Church were due to fire. But the C.P.A. has had no such conflagration and remains structurally sound. In fact, after reading the various news reports, it seems uncertain exactly why the building is coming down. The C.P.A. 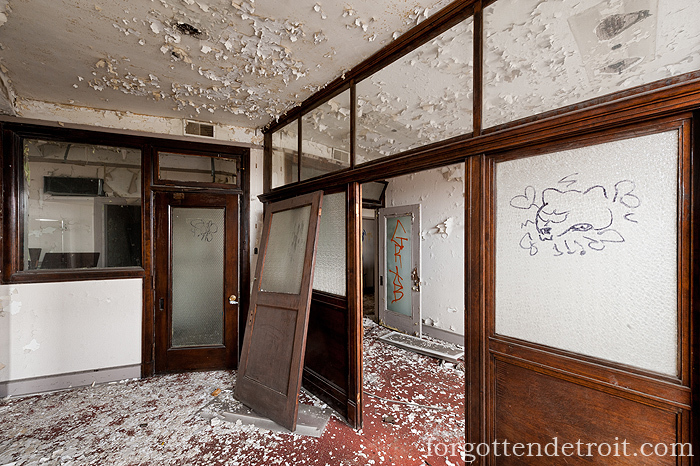 Building was built in 1923 for the Conductor’s Protective Association, which was an insurance firm for railroad workers. Thus the building’s location at Michigan Avenue and 14th Street, across Roosevelt Park from the Michigan Central Station makes sense. The organization remained here until the station closed in 1988. The building’s architect was Alvin E. Harley, although you could have fooled me since it looks exactly like every office building to come out of Albert Kahn’s firm during this period. Same, cornice, windows, etc. As it turns out, before setting out on his own, Harley had worked for Kahn and considered him a big influence. But that was all years before he received the C.P.A. job. Regardless, it is a handsome building that adds a fair amount of beauty to the neighborhood. The structure is dignified, and stands out among the earlier brick storefronts on Michigan Avenue. The odd shape of the site enhances its appeal and uniqueness. 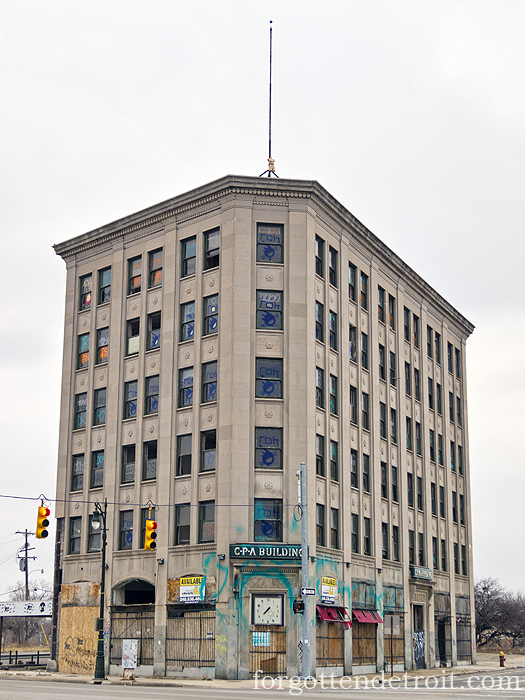 It is the perfect neighborhood office building, the type of building I wish Detroit had more of, not less of. The only real negative is the current proximity to I-75, as the inescapable sounds of traffic fill the interior. 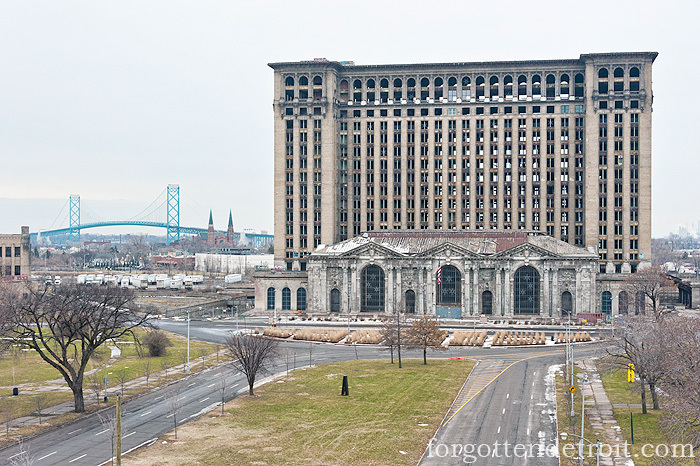 The building declined after the Michigan Central Station closed. 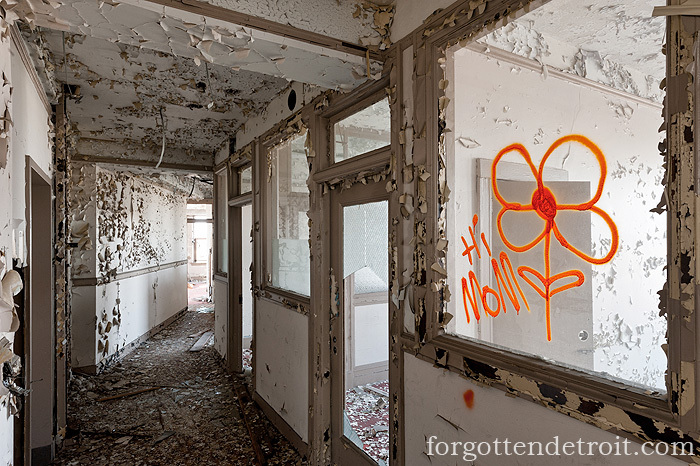 I suspect some of the floors were vacated at that time. However, the structure continued to house a number of tenants, including a bank, neighborhood association, and a LDS mission. I remember the building still being occupied during the late 1990s and into the 2000s, with lights burning on the upper floors well into the night. I’m not exactly sure when it closed for good. I read somewhere that it was in 2008, although that seems late to me. The building hasn’t faired well since. The exterior pictures I have here tell the story better than my words. Aside from broken windows and graffiti, a few years ago a vehicle crashed into the building, destroying a storefront and littering the sidewalk with stone fragments. It has been open to trespass for years, with the all-too-typical scrapping and damage being a result. When I visited the building three years ago I was struck with how much it reminded me of being in the various downtown skyscrapers a decade earlier. There was a definite United Artists vibe to it. I guess this is to be expected, given they are all office buildings from the same era. 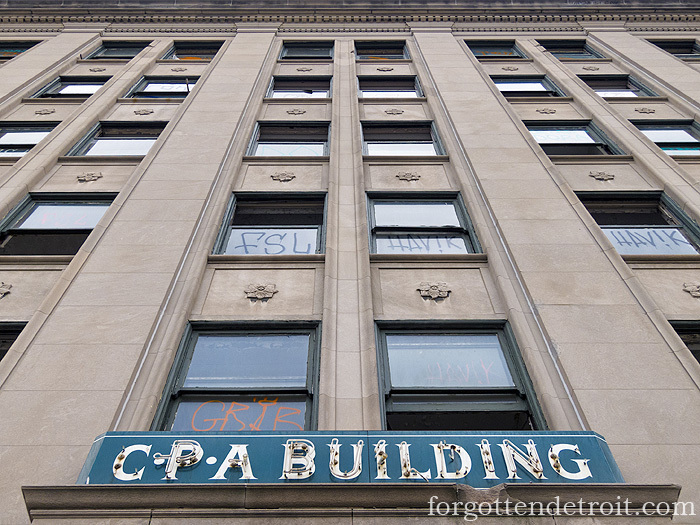 But given that most of the downtown buildings have now been demolished or renovated, being in the C.P.A. was almost a nostalgic trip back to the “good” old skyscraper graveyard. 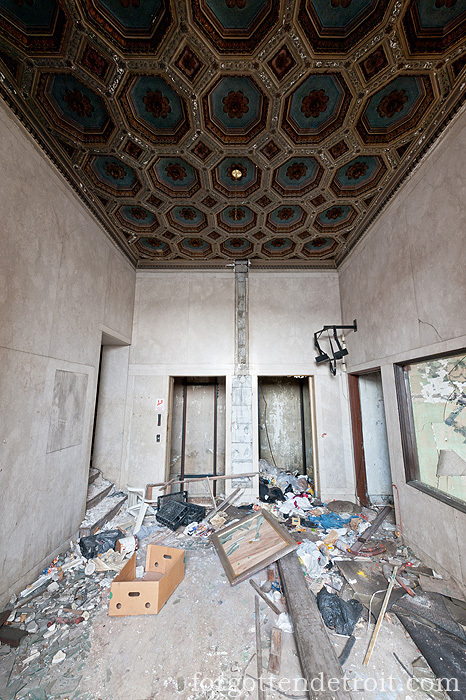 I guess the most notable aspect of the ground floor was the corner bank, which has a high ceiling and was filled with random junk. 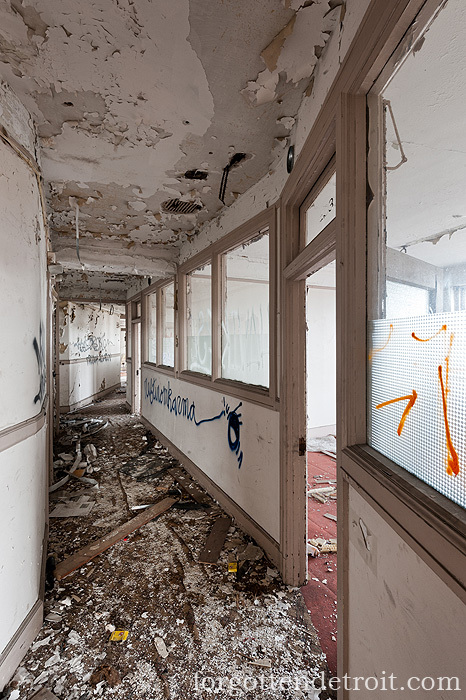 A hole punched into a wall by scrappers allowed access to the main lobby, and the rest of the building. The lobby is nice, but typical for the era. The office floors, on the other hand, are outright bizarre in their arrangement. The main corridors are not straight, but zig-zag. The result is every office is oddly shaped. I don’t think there was a single right angle in the entire building. I have no idea why the layout is like this. I tried to rationalize it by looking at the shape of the property, or considering the placement of the staircases and elevators. But nothing makes sense. Clearly either Harley or the C.P.A. had their reasons, they just escape me. The zig-zag corridors are pretty cool, it just doesn’t seem very efficient. 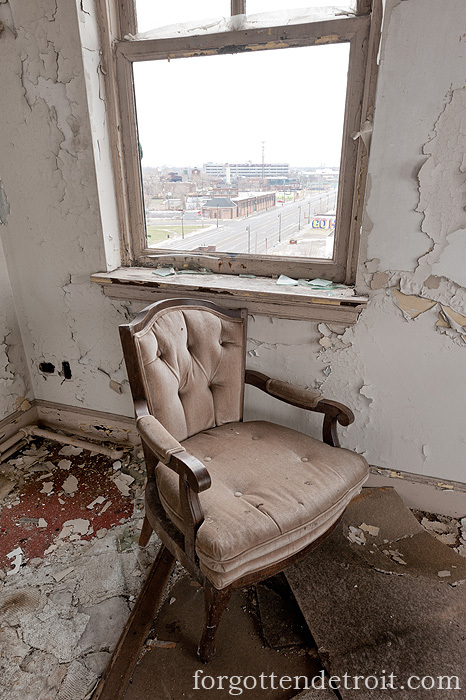 Drunken hallways aside, the highlight of the upper floors are the views of Corktown. The best of these are from the rooms on the Michigan Avenue side. They offer an excellent perspective of Roosevelt Park and the Michigan Central Station. 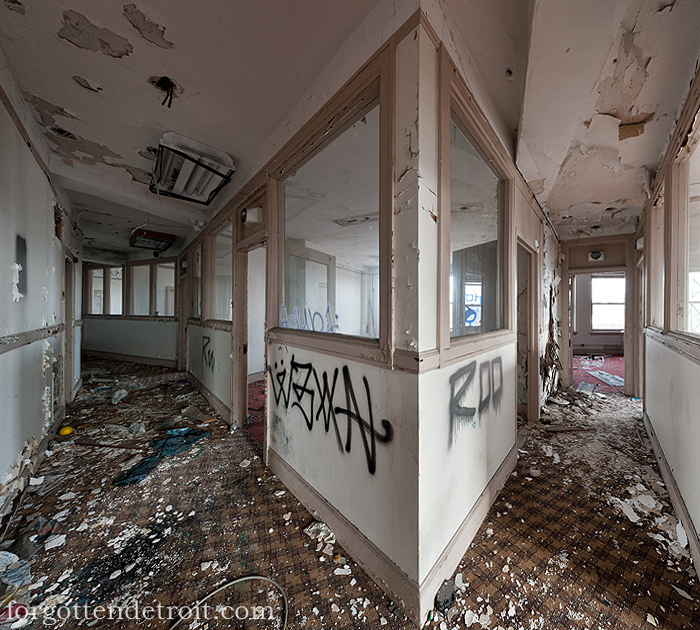 These rooms would sell like hotcakes if converted to residential. 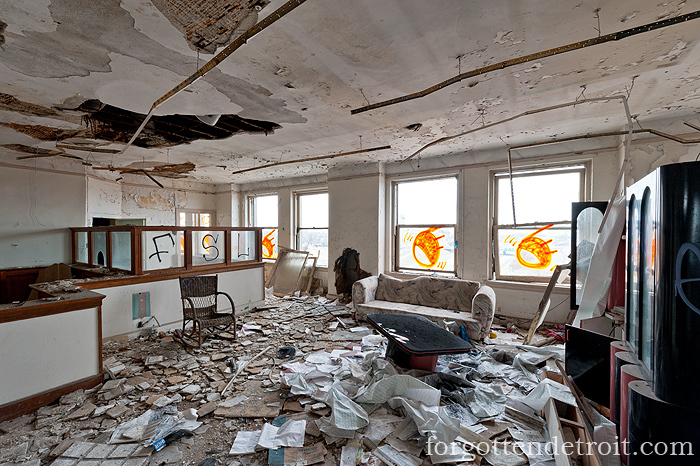 Granted, a lot can happen in three years, but from what I saw the interior wasn’t too badly destroyed. Graffiti and debris makes the damage appear worse than it really is. The steel and concrete infrastructure remains sound and most of the damaged materials are those that would be replaced in an adaptive reuse anyway. The C.P.A. 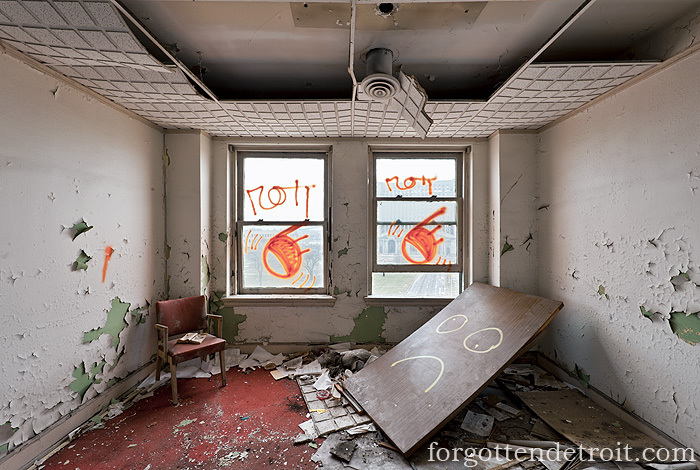 is no worse off than buildings like the Kales, Fort Shelby, and Book-Cadillac. 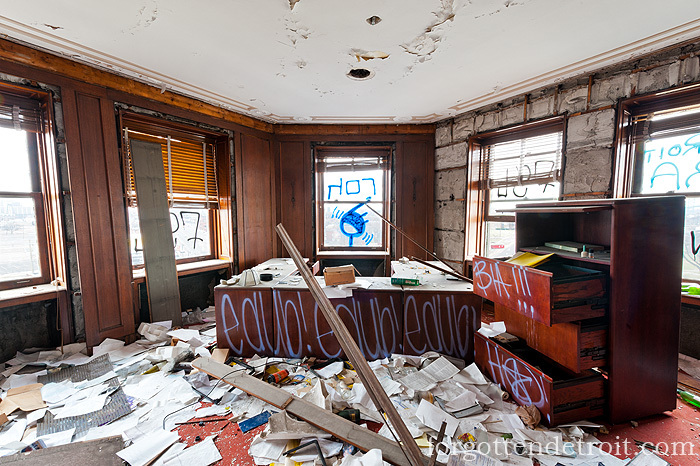 Given the economic development taking place in Corktown, I expected the structure to be renovated eventually. It is just one of those buildings I always thought would be there. From what I understand, Sequoia Property Partners bought the building in May, 2014 for $900,000 with the intention to rehab it. Clearly that has not happened and they have moved forward to have the building demolished next month. 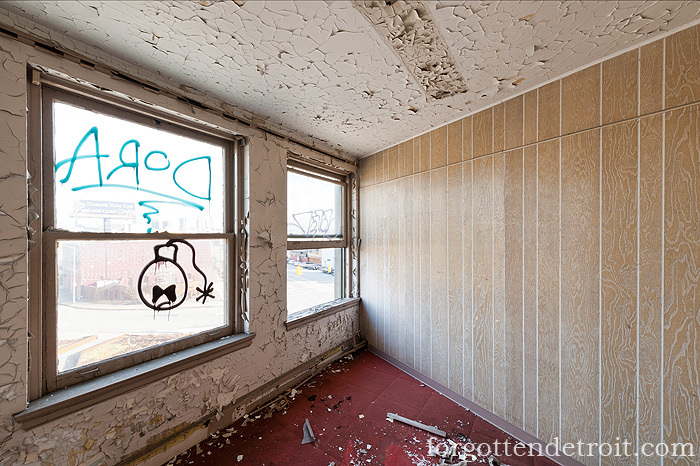 The reasoning seems fuzzy in that the owners blame neighborhood complaints and blight tickets, while neighboring businesses claim that is not the case and that they would like to see the building renovated. Simply put, this is a demolition that should not happen and is a situation that is especially ridiculous given the neighborhood in which the building sits. Over the past few days preservationists have mobilized and have been getting their voices heard. On Thursday the City Council’s Planning and Economic Development Committee approved a resolution to grant the building interim historic designation. This will go to City Council for approval next week. I’ve heard that today a “stop work” notice was posted on the building, but haven’t heard any details beyond that. Clearly the pending loss of this building as struck a nerve with a lot of people. It is refreshing to see that, in addition to the usual preservationists, that there is some movement in city government to stop this. I’m trying not too be hopeful. But I love surprises. It should be an interesting few days. 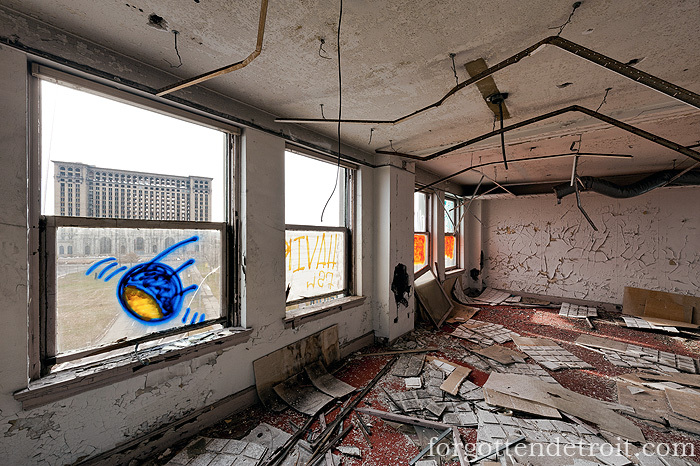 Detroit News: C.P.A. Building is Doomed – But Who’s to Blame? Every time I think the city finally “gets it” and realizes the the wealth of architectural in the city, I read something like this. The CPA Building has tons of visual appeal. 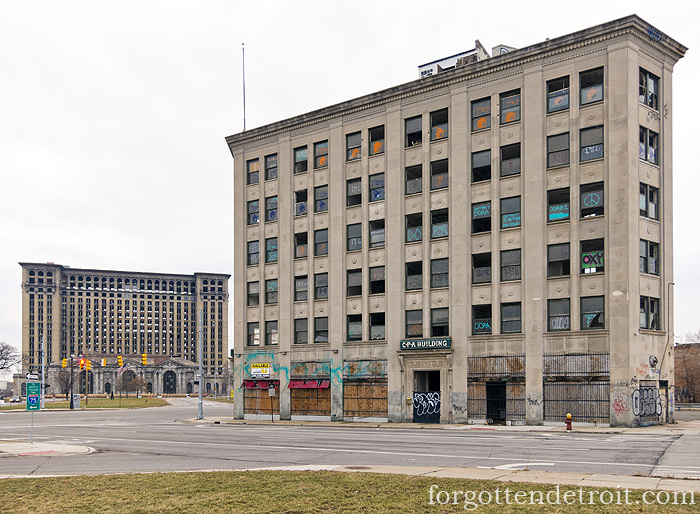 As a child I remember walking to Tigers and Lions games…we always stopped to marvel at this building. I came across your site while I was looking for information on Book Cadillac collectibles. I have a fabulous Book Cadillac tablecloth in very good condition that I am thinking of parting with. It reminds me of the State table cloths and aprons that were sold in the 40’s-50—it was probably sold in the hotel’s gift shop. Just looking for any/all information that might help me determine a fair price. My father taught at Redford High School in the 1940-50s, and I’ve scanned in a bunch of photos from his years there. Please contact me if you’d like to see these.